2011-03-01. New. Ships with Tracking Number! INTERNATIONAL WORLDWIDE Shipping available. Buy with confidence, excellent customer service! 2013-06-08. Good. Ships with Tracking Number! INTERNATIONAL WORLDWIDE Shipping available. May not contain Access Codes or Supplements. May be ex-library. Shipping & Handling by region. Buy with confidence, excellent customer service! Noontide Press, 1984. Paperback. Good. Gainesville, Fla, 1995-01-01. Paperback. Used:Good. CreateSpace Independent Publishing Platform. PAPERBACK. 1482370778 New Condition. . New. Noontide Press. PAPERBACK. 0939482126 New Condition. . New. 2003-06-02. Good. Ships with Tracking Number! INTERNATIONAL WORLDWIDE Shipping available. May not contain Access Codes or Supplements. May be ex-library. Shipping & Handling by region. Buy with confidence, excellent customer service! CreateSpace Independent Publishing Platform. PAPERBACK. 1481978551 Like New Condition. . Fine. Aziloth Books, 2011-08-15. Paperback. new. black & white illustrations. Major General Smedley D Butler was a military hero of the first rank, the winner of two Medals of Honour, a true 'fighting marine' whose courage and patriotism could not be doubted. Yet he came to believe that the wars in which he and his men had fought and bled and died were all pre-planned conflicts, designed not so much to defend America as to bloat the balance sheets of US banks and corporations. 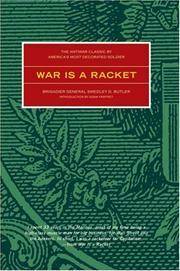 Filled with astounding details of the benefits the few make from the sufferings of the many, 'War is A Racket' is as relevant today as when it was first written. Mark Twain's 'The War Prayer' was considered so explosive by his contemporaries that the short anti-war piece was authorized for publication only after his death. 'The Complaint of Peace' was written in 1521 by Desiderius Erasmus, one of the greatest scholars of his day, as a reaction to the warlike times in which he lived. After an interval of nearly 500 years, this thoughtful critique of war still rings true. CreateSpace Independent Publishing Platform. PAPERBACK. 1482370778 Like New Condition. . Fine. Gainesville, Fla, 1995. Paperback. Good. Gainesville, Fla, January 1995. Paper Back Paper Back. Used - Very Good. Book is clean and tight. Has minor shelf wear. We put tracking on every shipment. CreateSpace Independent Publishing Platform, 2013-01-13. Paperback. Good.